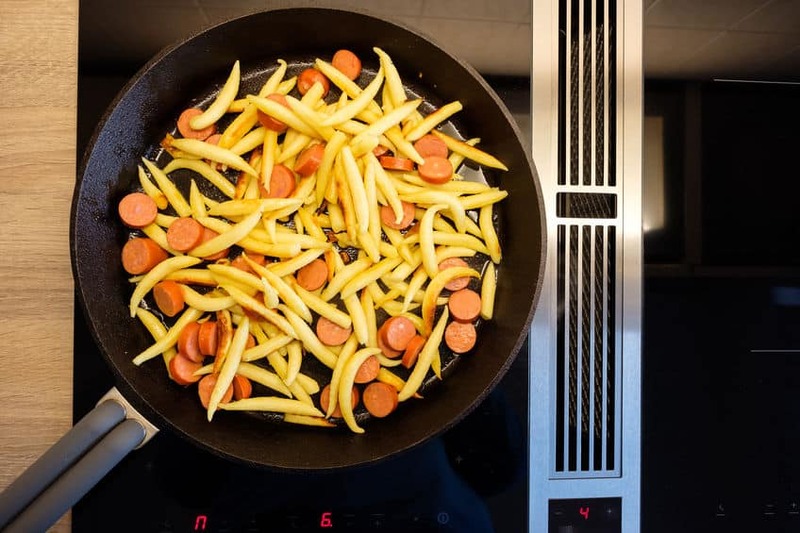 If you have a commercial business such as a food truck or small convenience store then a commercial induction cooktop is preferable to one designed specifically for residential use. Some commercial induction units can also be used for everyday home cooking while others should only be used for home brewing and large boils. Be sure to check the warranty and electrical requirements. Max Burton is a brand of Aervoe Industries Inc. which is headquartered in Gardnerville, NV. The subject of this review is the commercially rated Max Burton Digital ProChef-3000 Induction Cooktop. This high quality unit can be used in commercial businesses as well as in your home kitchen. It is a reliable, safety certified, and programmable unit. Two impressive features of the 6535 Model are the detachable temperature probe and the 9 inch coil. This sensor can measure food temperatures within 5 degrees. This 3000 Watt commercial induction cooking equipment must be connected to a 220 Volt power outlet. 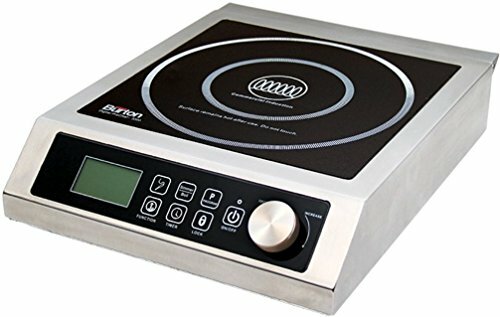 A 120 Volt, 1800 Watt commercial induction cooktop, the Max Burton 6515 Digital ProChef-1800 Induction Cooktop is also available. Induction ready cookware must be used with both units. The body of the Aervoe Industries 6535 Max Burton Digital ProChef-3000 Induction Cooktop is made of stainless steel. The cooking surface is glass and has two placement guides to assist in positioning the induction ready pots and pans. A coil diameter of 9 inches allows for the use of larger pots and pans. The angled control panel holds a large LCD display, touch screen controls and dial knob used to adjust the settings. The controls include the temperature probe function, function (select HEAT/TEMP), boil/simmer, timer, program cooking function, lock, and the ON/OFF power control. There are four cooking modes available in this commercial grade induction cooktop. The heating and temperature modes function independently. Temperature probe mode –the food temperature can be controlled within +/- five degrees F.
The physical dimensions of this unit are: 16.75” x 13.2” x 3.97” (L x W x H). The glass cooktop measures 11.25” x11.25”. This unit weighs 12.5 pounds and can hold cookware and contents up to 75 pounds. The cord length is 5 ft. This 3000 Watt commercial induction burner operates on a 220 AC power and requires 15 Amps. It comes with 13 power levels ranging from 500 to 3000 Watts. The first power level is 500 Watts, the second 800 and the remainder are in 200 watt increments. The one touch boil feature will automatically select power level 13. The power mode can be accessed by pressing the function button and selecting the HEAT mode. Power level 1 (default) will then appear and can be changed using the control knob. The TEMP mode is useful if more accurate temperature control is desired. This unit has 15 temperature levels with a range of 100º-450ºF. The temperature can be adjusted in 25 degree increments. To access the TEMP mode, press the function button. The default temperature is 100ºF as is the SIMMER function temperature. The temperature probe is made of stainless steel and is 8 inches long. It is stored in the back of the unit. The maximum timer settings vary according to the cooking mode and the temperature being used. The timer can be set for a maximum of 180 minutes in one minute increments. A maximum of 8 hours is possible when operating between 100º- 250ºF. For safety reasons, the maximum the timer can be set for when operating between 275º-450ºF is 180-minutes. To use the timer press the TIMER symbol and adjust the number of minutes desired by turning the CONTROL KNOB. The LCD display will show the initial setting (in minutes). The lock function can be activated at any time to lock in the settings. The unit can be unlocked in one of two ways: 1) touch and hold the LOCK symbol for 3 seconds or 2) Turn the unit off. An overheating sensor detects excessively high glass top temperature which causes the unit to automatically shut down. If the 220V input power supply is too high or too low voltage, the unit will shut down after one minute. The cooker will not operate if cookware that is not induction compatible is placed on the surface. The lock prevents changes in temperature or heating settings. The size of the pots and pans used is an important factor in obtaining optimal results. The cookware must have a height of at least 1.5”. The operating instructions for this Max Burton commercial grade induction cooktop state the minimum base diameter of the cooking vessel is 4.5” and the maximum is 15 inches. The maximum weight of the cookware and contents is 75 pounds. To obtain the best results be sure to center the pot or pan on the cooktop surface. Warning: Do not use an induction disk on this unit or any induction cooker that is greater than 1800 Watts as it might damage the unit and the cookware. A limited one-year warranty is provided. To obtain warranty performance, a warranty card has to be on file with Aervoe Industries, Inc. within 30-days of purchase with proof of purchase is required. 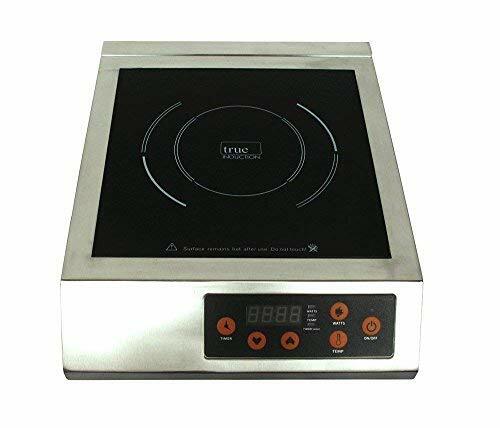 Why Buy This Particular Commercial Induction Cooker? There are three key reasons to buy the Aervoe Industries 6535 Max Burton Digital ProChef-3000 Induction Cooktop. First, this is a versatile unit in terms of both where and how it can be used. This induction hob can be used in both commercial and residential kitchens. It is can be used to brew beer, prepare slow cooker or quick and easy recipes. Second, the cooktop construction and features are impressive. It has a ball bearing-fan which is preferable to a short lived sleeve-bearing fan. The coil diameter is 9 inches instead of the usual 6 or 7 inch coil found in many induction cookers. The inclusion of a detachable temperature probe is a welcome accessory. The feature that is really helpful is the dial control used to change the temperature, power and timer settings. It's less of a hassle than the push or even touch buttons. This unit has a settings lock. For many consumers, this is a deal breaker. They just don't want to take a chance that the settings could be accidentally changed. Third, this is a very good overall value at a decent price point. 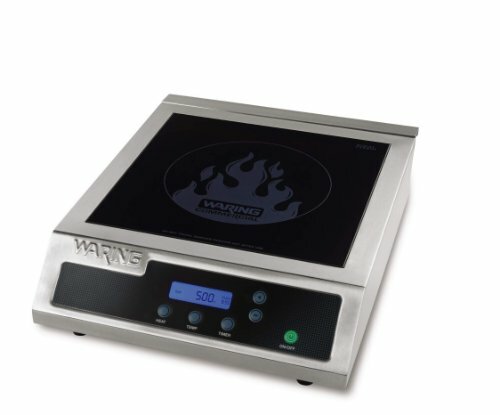 The Waring Commercial WIH400 Hi-Power Induction Burner is a solidly constructed, no-frills unit that certainly deserves a place on our list of induction cooktops for businesses. It is an 1800 Watt, 120 Volt unit that has an array of preset temperature options, all the necessary safety features and is easy to operate. In addition to the LCD display there are six buttons on the front of the unit. They are: heat, temperature, timer, two controls (+ and -) for adjusting the heat, and the on/off button. With this easy to operate user-interface, it works similarly to a traditional stovetop. Choose your cooking mode (temp or heat) and then use the + and - buttons to adjust the temperature or wattage. The Waring Commercial WIH400 Induction Burner has a combination of stainless steel and ceramic glass which allows it to seamlessly fit into any kitchen decor. The dimensions of the unit 16" x 13" x 4" (LxWxH). The size of the glass cooking surface is 11" x 11". 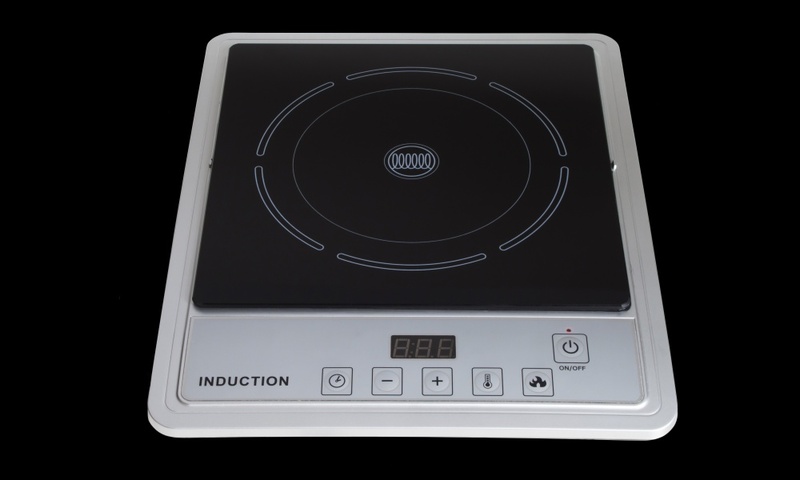 The optimum size of the bottom surface area of the induction ready cooking vessel should be 4.75" to 10" in diameter. There are 10 preset power options in the HEAT mode. The available settings are 200, 350, 500, 650, 800, 1000, 1200, 1400, 1600, 1800 Watts. This information was obtained from Conair/Waring customer service. This 1800 Watt cooktop must be plugged into a 120V outlet. The cord has a molded 3-prong grounding type plug. Either the HEAT or the TEMP function can be used, although not simultaneously. The HEAT mode allows one to choose the number of watts to use when cooking. There are 12 preset temperature options (TEMP mode) with a range of 120-500ºF. These settings, in Fahrenheit are: 120, 140, 160, 180, 210, 250, 280, 320, 380, 420, 460, and 500. This information was obtained from Waring Customer Service. When the unit is plugged in, it will default to displaying the temperatures in Fahrenheit. However, it can be changed to Celsius. The timer can be adjusted using the + and - buttons for any length of time between 1 minute and 10 hours. It will start to countdown when it reaches 59 seconds. When the time has expired, the unit will beep 4 times and the screen will blink. However, it is important to note that the unit will NOT automatically shutoff. The Waring WIH400 has a nice complement of safety features. The unit will shut off after an extended period of time if there is an empty pan on top of the cooker. It also has an overheat sensor, which, when activated causes the cooker to cease operation. This cooktop also has a low (75V) and high (145V) warning system. The unit will shut off after 1 minute if an induction compatible pot or pan is not on the glass cooking surface. A limited one-year warranty is provided. The Vollrath Company, LLC develops and manufactures kitchenware products and appliances for the foodservice industry. They are headquartered in Sheboygan, WI and have facilities in the United States, Mexico, the Netherlands, Spain and China. This review discusses the Vollrath 59500P Mirage Pro Countertop Induction Range Cooker. This product is intended for use in ONLY commercial food service businesses. The warranty is voided if it is used in a residential kitchen (Vollrath customer service verified this information). 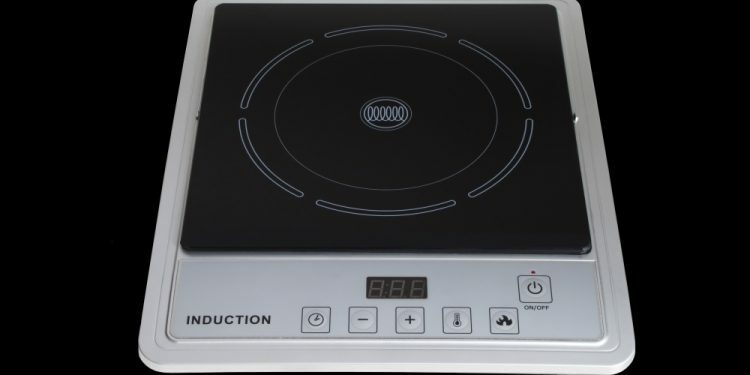 This 120V/50-60Hz/120V commercial grade induction cooktop is designed by Vollrath and is manufactured in a China factory that is a subsidiary of Vollrath, thus affording them manufacturing control. This Vollrath induction range has a stylish, modern design. The case frame is made of 18 gauge-stainless steel. The surface is black ceramic and has a placement guide to assist in centering the induction ready pot or pan. A ball bearing fan is used which is more durable and emits less noise than a sleeve bearing fan. The coil diameter of 8.6 inches (per Vollrath) allows for the use of larger pots and pans. The Vollrath 59500P Mirage Pro Countertop Induction Range Cooker has four insulated-gate bipolar transistor (IGBT) switches that share the induction process load. This is preferable to having just one switch because it improves the efficiency of the unit thereby using less electricity and providing faster cooking times. Sharing the load among four switches is certainly preferable to having just one switch that powers the whole cooktop. Most portable induction cooktops have one IGBT switch. The four rubber feet on the bottom of the unit keep it raised off the countertop or table. The cord is six feet long and has a three pronged plug (5-15P). This 1800 Watt commercial induction cooktop operates on a 120 AC power and requires a 15 Amp dedicated outlet. The control panel is slightly angled which lessens the chance of a hot pan touching the front section and damaging the controls. Three green buttons representing on/off, power/temp, and timer settings. Three LED which illuminate when the timer is being used and signals whether the temperature displayed is a Fahrenheit or Celsius reading. A manual knob is used to select the power/temperature level making it easy to change those settings. The physical dimensions of the entire Vollrath 59500P are: 15.25” x 14” x 3” (L x W x H). The glass cooktop measures 11” x 11” and the unit weighs 12.8 pounds. The Power or the Temperature mode can be used. There are 100 power levels with the approximate temperature range of 80°F to greater than 525°F. This large number of power levels allows the chef to select precise temperature controls during food preparation. There are 32 temperature levels that can be displayed in either Fahrenheit or Celsius. The temperature range of the Mirage® Pro 59500P is 80°F to 400°F in increments of 10 degrees. As with all portable induction burners, it takes 30-45 seconds for the desired temperature to be obtained since the thermometer is under the ceramic. It might take longer for cast iron than it would for multi-ply stainless steel. Unless the unit is unplugged, this unit will remember the last temperature setting used. The timer can be set from 1 to 180 minutes (in one minute increments) by pressing the TIMER button and using the CONTROL KNOB to select the desired time. The unit shuts off when the set time has elapsed. If the timer is not set, the unit will run indefinitely as long as there is an induction ready cooking vessel and contents on the cooktop. The size of the pots and pans used is an important factor in obtaining optimal results. The operating instructions for this commercial grade induction cooktop state the minimum base diameter of an induction ready cooking vessel must be 4.5” and the maximum 10.25". Cookware that has a footed base will not work on this cooker. To obtain the best results center the pot or pan on the cooktop surface. This Vollrath induction burner has these safety features and certifications. Auto shut off if the unit is overheating, the voltage is too high or too low, the pan is empty, or the cookware has been removed from the cooktop for more than five minutes. The words “HOT PAN” will flash on the display panel if the ceramic is too hot after a heating cycle has finished. The unit will not heat if the cookware is too small or is not induction ready. An error message appears if no pan is detected. This commercial induction cooktop is NSF and UL certified. A limited two year warranty is provided if this Vollrath induction cooktop is used in a commercial kitchen. Vollrath will not honor this warranty for residential use. I was impressed with Vollrath’s technical support. I called twice with several specific questions regarding the Mirage® Pro 59500P induction cooktop. Each time my questions were fully answered in a friendly and professional manner. LED display is easily read. Some consumers who have complained about reliability issues and the lack of accurate temperature control. The video below compares the Vollrath 59500P Mirage® Pro with the Vollrath (59300) 12" Mirage Cadet Induction Range - Mirage Cadet Series, another commercial induction cooktop. If you are looking for an induction cooker for commercial use, the Vollrath 59500P Mirage Pro Countertop Induction Range Cooker, 120-Volts, 1800-Watts, NSF is certainly worth considering. It is more expensive than other 1800 Watt induction cooktops. However, chefs appreciate its portability, solid construction and the ability to control the temperature while preparing food. Some consumers purchase this unit for their home kitchens because of its durability and construction, the large coil, and the flexibility of having 100 power levels despite the lack of warranty protection. Next up in our portable commercial induction cooker reviews is the Mr. Induction SR-183C. Although this 1800-Watt, 120Volt unit is specifically designed for commercial use, it can also be used in a residential kitchen. The Mr. 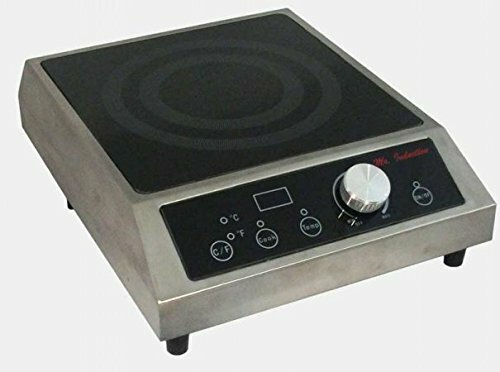 Induction SR-183C Countertop Commercial Range Induction Burner is durable, easy to use and has a large selection of temperature and power settings. The frame of the Mr. Induction SR-183C Commercial Burner is stainless steel and the cooking surface is ceramic glass. Under the 8 x 8 inch ceramic cooktop is a 6 inch heating element. The user interface is angled from the cooktop surface which is preferable to tablet-like models, as it lessens the chance of the pot or pan touching the controls. It has an LED display, a control knob and touch sensitive controls (°C/°F, COOK, TEMP, On/Off). Since this cooktop is designed primarily for commercial kitchens, controlling the temperature and power with a knob is a lot quicker and easier than continuously pressing up/down buttons. The flexibility of setting the temperature in either Celsius or Fahrenheit is a convenient feature. The two cooktop functions are COOK (power) and TEMP. There are 20 preset power options (COOK) from 350-1800Watts. The temperature range is 90-440°F in 20 degree increments except 170, 180, 260, 270, 350 and 360°F – in 10 degrees increments. 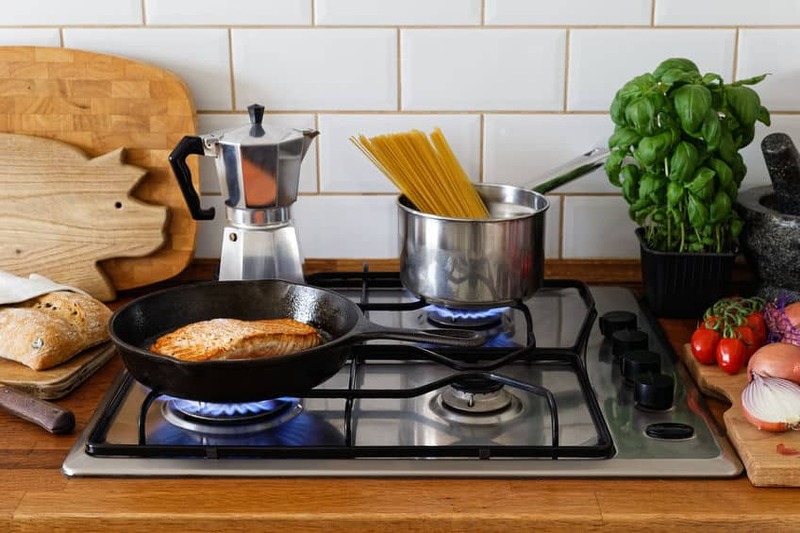 As with all induction stoves and cooktops, cookware that has a ferromagnetic base must be used. 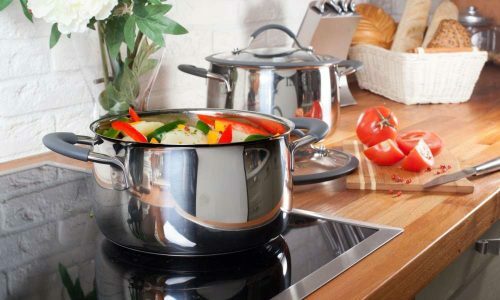 Steel, magnetic stainless steel, cast iron and enameled cast iron pots and pans are all induction friendly. The base of the cooking vessel should have a diameter of at least 4.5 inches. This Sunpentown induction cooker has Smart Scan Technology which recognizes the voltage as well as the pan size and type. 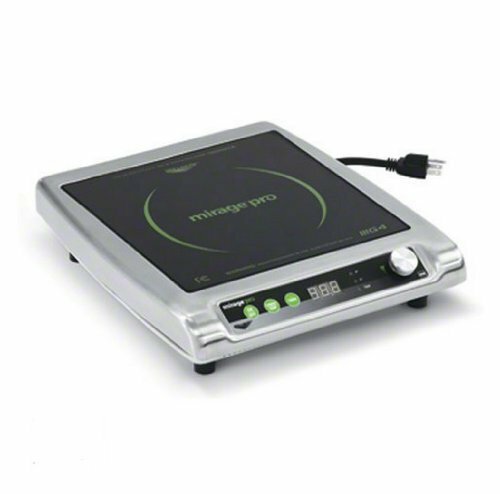 This commercial portable induction cooktop has important safety features, certifications and approvals. The unit will display an error message and then shut off under these conditions: too high/too low voltage, overheat sensor activates, the unit is not properly ventilated, if a pan or a pan that is not induction compatible is on the cooking surface. It has the appropriate FCC/CETL, ETL-Sanitation to NSF-4 certifications and approvals. The warranty for the Mr. Induction SR-183C is not clear as to whether it will be honored if this unit is used in a non-commercial environment. Purchasing an extended warranty may be an option. Mr. Induction is a brand of Sunpentown International Inc. which was founded in Taiwan in 1985 as the Sunpentown Electric Company. In 1993, the company expanded into the China, Japan and the United States markets under the name Sunpentown International Inc. (SPT). Headquartered in Industry, California, SPT develops and manufactures electrical home and commercial appliances including a diverse line of induction cooktops. I contacted Sunpentown’s customer service by telephone and was impressed by the willingness of the representative to answer all my questions. She was friendly and knowledgeable about this induction cooktop. I also contacted them by email twice and received complete and prompt responses. The True Induction 220v 3200 Watt Commercial Single Induction Cooktopis designed for the commercial market. This unit is used most often in as restaurant and commercial kitchens, or in the catering or food business. If used in the United States, it requires a standard 220V/240V plug and 20 amp. Most commercial kitchens meet this electrical requirement. The plug is a NEMA 6-20P (a round prong with two straight prongs, one of which is vertical and the other positioned sideways. This unit has a multitude of preset temperature and power options and a timer. The minimal controls make it easy to navigate. The unit was designed with the minimalist in mind. Select either the TEMP or WATT cooking mode and adjust the timer setting, temperature and wattage using the up and down arrows. The cooktop frame is stainless steel with a ceramic/glass cooking surface. Even though it does not have a sleek modern look, the stainless steel frame ensures durability. There are six buttons (not touchscreen): timer, up and down arrows and the temperature, power and timer settings. Two features that set it apart from some other commercial induction burners are the adjustable legs to change the height and bolt holes, so the unit can be mounted to a work tables. NOTE: The temperature shown on the LED/LCD display of the user interface is a result of the reading by the temperature sensor which is underneath the glass-ceramic cooking surface. It takes time for the temperature sensor reading to catch up to the actual temperature of the pan. This is especially problematic for meals that take a short amount of time to prepare. For this reason, some people prefer to only use the power settings. Those who use the temperature mode generally start out at a low temperature and gradually increase it. Some cooks used the TEMP setting if a recipe calls for a constant temperature or for simmering for a long period of time. There is a learning curve when it comes to preparing meals with an induction cooker, regardless of the brand. However, once you get used to it, the process is straightforward and for some, a lot safer than having a flame or electric coils. The dimensions of the unit 16”x 13” x 4” (LxWxH)and weighs 11.4 pounds. Optimal cookware has a flat bottom and a diameter of 4.5" - 10" inches. There are 15 preset power levels with a power range of 400 W to 3200 W adjustable in 200 Watt increments. Once the WATT mode is selected, the default power is 1600 Watts. The temperature range is from 150° to 450°F with the default being 270°F. The temperatures are adjustable in 10 degree increments. NOTE: The manufacturer claims 2 cups of water can be boiled in 1 minute. The timer can be adjusted up to 150 minutes, in 5 minute increments, by using the up and down arrow buttons. When the time expires the unit will beep and the cooktop will switch to standby mode. Turn the cooktop off once cooking has been completed by using the ON/OFF button. The cooking temperature is over 450°F in the TEMP mode. After 3 minutes in standby, the unit will turn off. It can be restarted if needed. 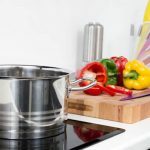 If the cookware being used is not induction ready (no ferromagnetic qualities) or if the base of the cooking vessel is too small, the unit will beep and go to standby mode. The video below is only 30 seconds long and shows how to use this cooktop. As a heads up, you might want to mute the sound as the music is really irritating. Connect the unit to the power source. A beep will sound and the display will light up for a short time. 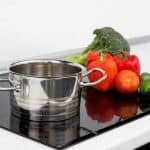 Place induction compatible cookware in the middle of the glass cooking surface. Press the ON/OFF button to activate the cooktop. Select the cooking mode you prefer, WATTS or TEMP. The settings can be adjusted using the up or down button and changed any time. After cooking is finished, turn off the cooktop by pressing the ON/OFF button. The warranty is only honored if the unit is purchased from an authorized True Induction dealer. True Induction's website http://www.trueinduction.com/Where-to-Buy.aspx lists these authorized dealers. Furthermore, if the warranty registration card is not completed and returned, only the standard 1 year limited warranty will apply. What cookware can be used on a commercial induction hob? The cookware requirements are the same for all types of induction stoves and cooktops. The base must be flat and made with ferrous materials, such as iron and other magnetic materials. 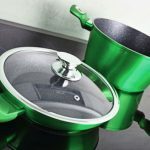 Examples of induction ready cookware materials are: carbon steel, cast iron, enameled cast iron, iron/steel, and magnetized stainless steel. To check your cookware, place a magnet on the base of your pans and pots and if it securely sticks it is induction compatible. The unit will not operate if unsuitable cookware is placed on the surface. Does the cookware make noise on the cooktop? A humming or buzzing sound produced by the pot or pan while cooking is normal. Cast iron or enameled cast iron cookware tend to make less noise than those that are lighter in weight such as multi-ply stainless steel. The sound level also depends upon the size of the pan and the amount of ingredients it contains. Pans that are the same size as the burner ring tend to produce less noise. What does NSF Certification mean? NSF is a non-profit organization that evaluates and tests food service and restaurant supply products to make sure they are designed and built in a way that promotes food safety. To be NSF certified, products must meet certain standards. Not only is the equipment evaluated, the manufacturing plant is audited by an NSF representative. This examination is conducted to make sure the product is manufactured using sanitary methods and is repeated annually if the company wants their product to continue to be NSF certified. One of the activities of Underwriters Laboratories (UL) is to develop product safety standards. If a product and its components has been UL certified, then it has met specific safety standards that ensure the product is safe for the consumer to use. This includes the electrical, design, and structure of the unit.